For other uses, see Albedo (disambiguation). Albedo (/ælˈbiːdoʊ/) is the "whiteness" of a surface. It is a reflection coefficient, and has a value of less than one. Albedo is derived from Latin albedo "whiteness" (or reflected sunlight) in turn from albus "white", is the diffuse reflectivity or reflecting power of a surface. The albedo of a surface is the ratio of radiation reflected from the surface to the incident radiation. Its dimensionless nature lets it be expressed as a percentage and is measured on a scale from zero (no reflection) of a perfectly black surface to 1 for perfect reflection of a white surface. Because albedo is the ratio of all reflected radiation to incident radiation, it will include both the diffuse and specular radiation reflected from an object. It is, however, common to assume a surface reflects in either a totally specular manner or a totally diffuse manner, as this can simplify calculations. Albedo depends on the wavelength of the radiation. When quoted unqualified, it usually refers to some appropriate average across the spectrum of visible light. In general, the albedo depends on the directional distribution of incident radiation, except for the extreme case of Lambertian surfaces, which scatter radiation in all directions according to a cosine function and therefore have an albedo that is independent of the incident distribution. In practice, a bidirectional reflectance distribution function (BRDF) may be required to accurately characterize the scattering properties of a surface, but albedo is very useful as a first approximation. The albedo is an important concept in climatology, astronomy, and calculating reflectivity of surfaces in Leadership in Energy and Environmental Design (LEED) sustainable-rating systems for buildings. 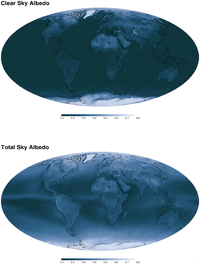 The average overall albedo of Earth, its planetary albedo, is 30 to 35% because of cloud cover, but widely varies locally across the surface because of different geological and environmental features. The term was introduced into optics by Johann Heinrich Lambert in his 1760 work Photometria. Any albedo in visible light range from up to 0.9 for fresh snow to about 0.04 for charcoal, one of the darkest substances. Deeply shadowed cavities can achieve an effective albedo approaching the zero of a black body. When seen from a distance, the ocean surface has a low albedo, as do most forests, whereas desert areas have some of the highest albedos among landforms. Most land areas are in an albedo range of 0.1 to 0.4. The average albedo of Earth is about 0.3. This is far higher than for the ocean primarily because of the contribution of clouds. Earth's surface albedo is regularly estimated via Earth observation satellite sensors such as NASA's MODIS instruments on board the Terra and Aqua satellites. As the total amount of reflected radiation cannot be directly measured by satellite, a mathematical model of the BRDF is used to translate a sample set of satellite reflectance measurements into estimates of directional-hemispherical reflectance and bi-hemispherical reflectance (e.g.). Earth's average surface temperature due to its albedo and the greenhouse effect is currently about 15 °C. If Earth were frozen entirely (and hence be more reflective) the average temperature of the planet would drop below −40 °C. If only the continental land masses became covered by glaciers, the mean temperature of the planet would drop to about 0 °C. In contrast, if the entire Earth is covered by water—a so-called aquaplanet—the average temperature on the planet would rise to just under 27 °C. It has been shown that for many applications involving terrestrial albedo, the albedo at a particular solar zenith angle θi can reasonably be approximated by the proportionate sum of two terms: the directional-hemispherical reflectance at that solar zenith angle, , and the bi-hemispherical reflectance, the proportion concerned being defined as the proportion of diffuse illumination . Directional-hemispherical reflectance is sometimes referred to as black-sky albedo and bi-hemispherical reflectance as white-sky albedo. These terms are important because they allow the albedo to be calculated for any given illumination conditions from a knowledge of the intrinsic properties of the surface. The albedos of planets, satellites and asteroids can be used to infer much about their properties. The study of albedos, their dependence on wavelength, lighting angle ("phase angle"), and variation in time comprises a major part of the astronomical field of photometry. For small and far objects that cannot be resolved by telescopes, much of what we know comes from the study of their albedos. 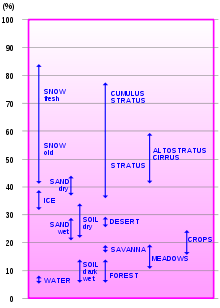 For example, the absolute albedo can indicate the surface ice content of outer Solar System objects, the variation of albedo with phase angle gives information about regolith properties, whereas unusually high radar albedo is indicative of high metal content in asteroids. Enceladus, a moon of Saturn, has one of the highest known albedos of any body in the Solar System, with 99% of EM radiation reflected. Another notable high-albedo body is Eris, with an albedo of 0.96. Many small objects in the outer Solar System and asteroid belt have low albedos down to about 0.05. A typical comet nucleus has an albedo of 0.04. Such a dark surface is thought to be indicative of a primitive and heavily space weathered surface containing some organic compounds. The overall albedo of the Moon is measured to be around 0.136, but it is strongly directional and non-Lambertian, displaying also a strong opposition effect. Although such reflectance properties are different from those of any terrestrial terrains, they are typical of the regolith surfaces of airless Solar System bodies. Two common albedos that are used in astronomy are the (V-band) geometric albedo (measuring brightness when illumination comes from directly behind the observer) and the Bond albedo (measuring total proportion of electromagnetic energy reflected). Their values can differ significantly, which is a common source of confusion. In detailed studies, the directional reflectance properties of astronomical bodies are often expressed in terms of the five Hapke parameters which semi-empirically describe the variation of albedo with phase angle, including a characterization of the opposition effect of regolith surfaces. where is the astronomical albedo, is the diameter in kilometers, and is the absolute magnitude. Although the albedo–temperature effect is best known in colder, whiter regions on Earth, the maximum albedo is actually found in the tropics where year-round illumination is greater. The maximum is additionally in the northern hemisphere, varying between three and twelve degrees north. The minima are found in the subtropical regions of the northern and southern hemispheres, beyond which albedo increases without respect to illumination. The intensity of albedo temperature effects depend on the amount of albedo and the level of local insolation (solar irradiance); high albedo areas in the arctic and antarctic regions are cold due to low insolation, where areas such as the Sahara Desert, which also have a relatively high albedo, will be hotter due to high insolation. Tropical and sub-tropical rain forest areas have low albedo, and are much hotter than their temperate forest counterparts, which have lower insolation. Because insolation plays such a big role in the heating and cooling effects of albedo, high insolation areas like the tropics will tend to show a more pronounced fluctuation in local temperature when local albedo changes. cold and wet, which form over temperate, polar and sub-polar oceans. Different temperatures between the air masses result in different air pressures, and the masses develop into pressure systems. High-pressure systems flow toward lower pressure, driving weather from north to south in the northern hemisphere, and south to north in the southern. However, due to Earth's rotation, the Coriolis effect further complicates flow and creates several weather/climate bands and the jet streams. When an area's albedo changes due to snowfall, a snow–temperature feedback results. A layer of snowfall increases local albedo, reflecting away sunlight, leading to local cooling. In principle, if no outside temperature change affects this area (e.g. a warm air mass), the raised albedo and lower temperature would maintain the current snow and invite further snowfall, deepening the snow–temperature feedback. However, because local weather is dynamic due to the change of seasons, eventually warm air masses and a more direct angle of sunlight (higher insolation) cause melting. When the melted area reveals surfaces with lower albedo, such as grass or soil, the effect is reversed: the darkening surface lowers albedo, increasing local temperatures, which induces more melting and thus reducing the albedo further, resulting in still more heating. Snow albedo is highly variable, ranging from as high as 0.9 for freshly fallen snow, to about 0.4 for melting snow, and as low as 0.2 for dirty snow. Over Antarctica they average a little more than 0.8. If a marginally snow-covered area warms, snow tends to melt, lowering the albedo, and hence leading to more snowmelt because more radiation is being absorbed by the snowpack (the ice–albedo positive feedback). Cryoconite, powdery windblown dust containing soot, sometimes reduces albedo on glaciers and ice sheets. Hence, small errors in albedo can lead to large errors in energy estimates, which is why it is important to measure the albedo of snow-covered areas through remote sensing techniques rather than applying a single value over broad regions. Albedo works on a smaller scale, too. In sunlight, dark clothes absorb more heat and light-coloured clothes reflect it better, thus allowing some control over body temperature by exploiting the albedo effect of the colour of external clothing. Albedo can affect the electrical energy output of solar photovoltaic devices. For example, the effects of a spectrally responsive albedo are illustrated by the differences between the spectrally weighted albedo of solar photovoltaic technology based on hydrogenated amorphous silicon (a-Si:H) and crystalline silicon (c-Si)-based compared to traditional spectral-integrated albedo predictions. Research showed impacts of over 10%. More recently, the analysis was extended to the effects of spectral bias due to the specular reflectivity of 22 commonly occurring surface materials (both human-made and natural) and analyzes the albedo effects on the performance of seven photovoltaic materials covering three common photovoltaic system topologies: industrial (solar farms), commercial flat rooftops and residential pitched-roof applications. In seasonally snow-covered zones, winter albedos of treeless areas are 10% to 50% higher than nearby forested areas because snow does not cover the trees as readily. Deciduous trees have an albedo value of about 0.15 to 0.18 whereas coniferous trees have a value of about 0.09 to 0.15. Studies by the Hadley Centre have investigated the relative (generally warming) effect of albedo change and (cooling) effect of carbon sequestration on planting forests. They found that new forests in tropical and midlatitude areas tended to cool; new forests in high latitudes (e.g. Siberia) were neutral or perhaps warming. Water reflects light very differently from typical terrestrial materials. The reflectivity of a water surface is calculated using the Fresnel equations (see graph). At the scale of the wavelength of light even wavy water is always smooth so the light is reflected in a locally specular manner (not diffusely). The glint of light off water is a commonplace effect of this. 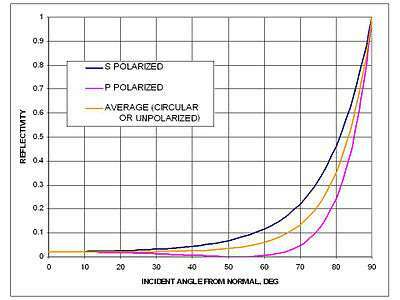 At small angles of incident light, waviness results in reduced reflectivity because of the steepness of the reflectivity-vs.-incident-angle curve and a locally increased average incident angle. Although the reflectivity of water is very low at low and medium angles of incident light, it becomes very high at high angles of incident light such as those that occur on the illuminated side of Earth near the terminator (early morning, late afternoon, and near the poles). However, as mentioned above, waviness causes an appreciable reduction. Because light specularly reflected from water does not usually reach the viewer, water is usually considered to have a very low albedo in spite of its high reflectivity at high angles of incident light. Note that white caps on waves look white (and have high albedo) because the water is foamed up, so there are many superimposed bubble surfaces which reflect, adding up their reflectivities. Fresh 'black' ice exhibits Fresnel reflection. Cloud albedo has substantial influence over atmospheric temperatures. Different types of clouds exhibit different reflectivity, theoretically ranging in albedo from a minimum of near 0 to a maximum approaching 0.8. "On any given day, about half of Earth is covered by clouds, which reflect more sunlight than land and water. Clouds keep Earth cool by reflecting sunlight, but they can also serve as blankets to trap warmth." Albedo and climate in some areas are affected by artificial clouds, such as those created by the contrails of heavy commercial airliner traffic. A study following the burning of the Kuwaiti oil fields during Iraqi occupation showed that temperatures under the burning oil fires were as much as 10 °C colder than temperatures several miles away under clear skies. Aerosol direct effect. Aerosols directly scatter and absorb radiation. The scattering of radiation causes atmospheric cooling, whereas absorption can cause atmospheric warming. Aerosol indirect effect. Aerosols modify the properties of clouds through a subset of the aerosol population called cloud condensation nuclei. Increased nuclei concentrations lead to increased cloud droplet number concentrations, which in turn leads to increased cloud albedo, increased light scattering and radiative cooling (first indirect effect), but also leads to reduced precipitation efficiency and increased lifetime of the cloud (second indirect effect). Another albedo-related effect on the climate is from black carbon particles. The size of this effect is difficult to quantify: the Intergovernmental Panel on Climate Change estimates that the global mean radiative forcing for black carbon aerosols from fossil fuels is +0.2 W m−2, with a range +0.1 to +0.4 W m−2. Black carbon is a bigger cause of the melting of the polar ice cap in the Arctic than carbon dioxide due to its effect on the albedo. Human activities (e.g. deforestation, farming, and urbanization) change the albedo of various areas around the globe. However, quantification of this effect on the global scale is difficult. Single-scattering albedo is used to define scattering of electromagnetic waves on small particles. It depends on properties of the material (refractive index); the size of the particle or particles; and the wavelength of the incoming radiation. 1 2 Pon, Brian (30 June 1999). "Pavement Albedo". Heat Island Group. Archived from the original on 29 August 2007. Retrieved 27 August 2007. ↑ "Thermodynamics | Thermodynamics: Albedo | National Snow and Ice Data Center". nsidc.org. Retrieved 2016-08-14. ↑ Alan K. Betts; John H. Ball (1997). "Albedo over the boreal forest". Journal of Geophysical Research. 102 (D24): 28,901–28,910. Bibcode:1997JGR...10228901B. doi:10.1029/96JD03876. Archived from the original on 30 September 2007. Retrieved 27 August 2007. 1 2 3 "The Climate System". Manchester Metropolitan University. Retrieved 11 November 2007. 1 2 3 4 5 Tom Markvart; Luis CastaŁżer (2003). Practical Handbook of Photovoltaics: Fundamentals and Applications. Elsevier. ISBN 1-85617-390-9. ↑ Tetzlaff, G. (1983). Albedo of the Sahara. Cologne University Satellite Measurement of Radiation Budget Parameters. pp. 60–63. ↑ "Albedo – from Eric Weisstein's World of Physics". Scienceworld.wolfram.com. Retrieved 19 August 2011. ↑ Goode, P. R.; et al. (2001). "Earthshine Observations of the Earth's Reflectance". Geophysical Research Letters. 28 (9): 1671–1674. Bibcode:2001GeoRL..28.1671G. doi:10.1029/2000GL012580. ↑ "MODIS BRDF/Albedo Product: Algorithm Theoretical Basis Document, Version 5.0" (PDF). Archived from the original (PDF) on 1 June 2009. Retrieved 2 June 2009. ↑ "Snowball Earth: Ice thickness on the tropical ocean" (PDF). Retrieved 20 September 2009. ↑ "Effect of land albedo, CO2, orography, and oceanic heat transport on extreme climates" (PDF). Retrieved 20 September 2009. ↑ "Global climate and ocean circulation on an aquaplanet ocean-atmosphere general circulation model" (PDF). Archived from the original (PDF) on 20 September 2009. Retrieved 20 September 2009. ↑ Roman, M. O.; C.B. Schaaf; P. Lewis; F. Gao; G.P. Anderson; J.L. Privette; A.H. Strahler; C.E. Woodcock; M. Barnsley (2010). "Assessing the Coupling between Surface Albedo derived from MODIS and the Fraction of Diffuse Skylight over Spatially-Characterized Landscapes". Remote Sensing of Environment. 114 (4): 738–760. doi:10.1016/j.rse.2009.11.014. ↑ Sicardy, B.; Ortiz, J. L.; Assafin, M.; Jehin, E.; Maury, A.; Lellouch, E.; Gil-Hutton, R.; Braga-Ribas, F.; et al. (2011). "Size, density, albedo and atmosphere limit of dwarf planet Eris from a stellar occultation" (PDF). European Planetary Science Congress Abstracts. 6: 137. Bibcode:2011epsc.conf..137S. Retrieved 14 September 2011. ↑ Wm. Robert Johnston (17 September 2008). "TNO/Centaur diameters and albedos". Johnston's Archive. Archived from the original on 22 October 2008. Retrieved 17 October 2008. ↑ Wm. Robert Johnston (28 June 2003). "Asteroid albedos: graphs of data". Johnston's Archive. Archived from the original on 17 May 2008. Retrieved 16 June 2008. ↑ Robert Roy Britt (29 November 2001). "Comet Borrelly Puzzle: Darkest Object in the Solar System". Space.com. Archived from the original on 22 January 2009. Retrieved 1 September 2012. ↑ Matthews, G. (2008). "Celestial body irradiance determination from an underfilled satellite radiometer: application to albedo and thermal emission measurements of the Moon using CERES". Applied Optics. 47 (27): 4981–4993. Bibcode:2008ApOpt..47.4981M. doi:10.1364/AO.47.004981. PMID 18806861. ↑ Medkeff, Jeff (2002). "Lunar Albedo". Archived from the original on 23 May 2008. Retrieved 5 July 2010. ↑ Dan Bruton. "Conversion of Absolute Magnitude to Diameter for Minor Planets". Department of Physics & Astronomy (Stephen F. Austin State University). Archived from the original on 10 December 2008. Retrieved 7 October 2008. 1 2 Winston, Jay (1971). "The Annual Course of Zonal Mean Albedo as Derived From ESSA 3 and 5 Digitized Picture Data". Monthly Weather Review. 99 (11): 818–827. Bibcode:1971MWRv...99..818W. doi:10.1175/1520-0493(1971)099<0818:TACOZM>2.3.CO;2. ↑ Hall, D.K. and Martinec, J. (1985), Remote sensing of ice and snow. Chapman and Hall, New York, 189 pp. ↑ "Health and Safety: Be Cool! (August 1997)". Ranknfile-ue.org. Retrieved 19 August 2011. ↑ Andrews, Rob W.; Pearce, Joshua M. (2013). "The effect of spectral albedo on amorphous silicon and crystalline silicon solar photovoltaic device performance". Solar Energy. 91: 233–241. Bibcode:2013SoEn...91..233A. doi:10.1016/j.solener.2013.01.030. ↑ Brennan, M.P. ; Abramase, A.L. ; Andrews, R.W. ; Pearce, J. M. (2014). "Effects of spectral albedo on solar photovoltaic devices". Solar Energy Materials and Solar Cells. 124: 111–116. doi:10.1016/j.solmat.2014.01.046. ↑ Betts, RA (2000). "Offset of the potential carbon sink from boreal forestation by decreases in surface albedo". Nature. 408 (6809): 187–190. Bibcode:2000Natur.408..187B. doi:10.1038/35041545. PMID 11089969. ↑ Boucher; et al. (2004). "Direct human influence of irrigation on atmospheric water vapour and climate". Climate Dynamics. 22 (6–7): 597–603. Bibcode:2004ClDy...22..597B. doi:10.1007/s00382-004-0402-4. ↑ Bonan, GB (2008). "Forests and Climate Change: Forcings, Feedbacks, and the Climate Benefits of Forests". Science. 320 (5882): 1444–1449. Bibcode:2008Sci...320.1444B. doi:10.1126/science.1155121. PMID 18556546. ↑ Betts, Richard A. (2000). "Offset of the potential carbon sink from boreal forestation by decreases in surface albedo". Nature. 408 (6809): 187–190. Bibcode:2000Natur.408..187B. doi:10.1038/35041545. PMID 11089969. ↑ "Spectral Approach To Calculate Specular reflection Of Light From Wavy Water Surface" (PDF). Vih.freeshell.org. Retrieved 2015-03-16. ↑ "Baffled Scientists Say Less Sunlight Reaching Earth". LiveScience. 24 January 2006. Retrieved 19 August 2011. ↑ "Contrails reduce daily temperature range" (PDF). Nature. 418: 601. 8 August 2002. Bibcode:2002Natur.418..601T. doi:10.1038/418601a. PMID 12167846. Archived from the original (PDF) on 3 May 2006. Retrieved 7 July 2015. ↑ Cahalan, Robert F. (30 May 1991). "The Kuwait oil fires as seen by Landsat". Journal of Geophysical Research: Atmospheres. Adsabs.harvard.edu. 97: 14565. Bibcode:1992JGR....9714565C. doi:10.1029/92JD00799. ↑ "Climate Change 2001: The Scientific Basis". Grida.no. Archived from the original on 29 June 2011. Retrieved 19 August 2011. ↑ Spracklen, D. V; Bonn, B.; Carslaw, K. S (2008). "Boreal forests, aerosols and the impacts on clouds and climate" (PDF). Philosophical Transactions of the Royal Society A. 366 (1885): 4613–4626. Bibcode:2008RSPTA.366.4613S. doi:10.1098/rsta.2008.0201. PMID 18826917. Look up albedo in Wiktionary, the free dictionary.